Well, after taking a couple of weeks off, I'm back. I felt like I was forcing the photos and I was no longer enjoying it - which came through in my pictures. So I took a step back and when I saw that the challenge this week was Spring, I decided it was a good time to try again. When I was crawling around my back yard one morning before work, I was utterly surprised by the perfect drop of water on a patch of clover I had decided to capture. I've been playing around with the shots in Photoshop and PhotoBucket - and it has been fun. I like fun. If you want to see how other's captured Spring this week, head on over to You Capture @I Should Be Folding Laundry. It's good to be back. wow the one with the water drop is amazing! I also loved how you turned a dandelion into a beautiful thing! I LOVE your second water drop shot! I love the water drops!! I've been wanting to capture something like that too. I will definitely have to try now. Thanks for posting! I also took a bit of a hiatus from You Capture...and now I'm back! I LOVE the water drop photos!! Beautiful, beautiful captures! And that water drop- don't you just LOVE coming across that kind of stuff at ust the right time? So glad you're having fun with it again. 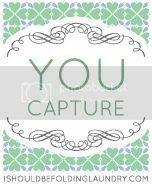 I'm one week away from my year anniversary with You Capture, and will likely take a break as well. I really like your second photo. Nicely done. Really nice shots!! My first time here at You Capture. Sometimes I need to take a break too. Glad you are back. I love your spring shots, especially the dandelions! I am back this week too! Something about "spring" just can't keep you away!! That water drop is stunning!!! I like how you showed the different colorations. I prefer the more vibrant ones myself. :) LOVE your water drop - what an awesome shot! That water droplet is like Mother Nature's crystal ball. We can look in and see all the blooms we have to look forward to in the next few months. Gorgeous! hooray for green grass and spring! It is a perfect drop! Love your photos and I am glad you are back. CARRIE! These are beyond beautiful. So glad you decided to take a little breather because it is clear you are truly having "fun!" Amazing work.